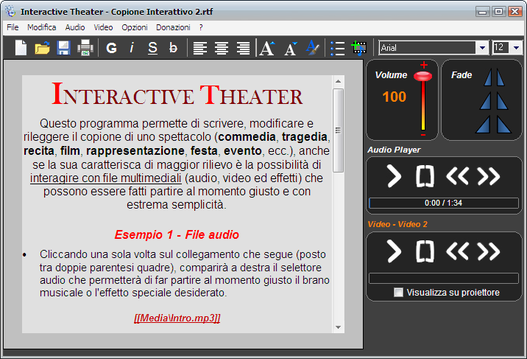 Interactive Theater Free allows you to write, edit, save, print scripts for theater, cabaret, variety, television, etc., with the ability to interact with audio and video files that can be managed directly from the program. Used to start, pause and stop music, sound effects, movies, directly from one clean interface, simple and intuitive. Videos can be easily shown directly on the projector connected to the PC, without any complicated settings. A new type of export from Excel to the Internet. Alf is an interactive flash character with voice and lip synchronization. Qweas is providing links to Interactive Theater Free 1.2.0.7 as a courtesy, and makes no representations regarding Interactive Theater Free or any other applications or any information related thereto. Any questions, complaints or claims regarding this application Interactive Theater Free 1.2.0.7 must be directed to the appropriate software vendor. You may click the publisher link of Interactive Theater Free on the top of this page to get more details about the vendor.